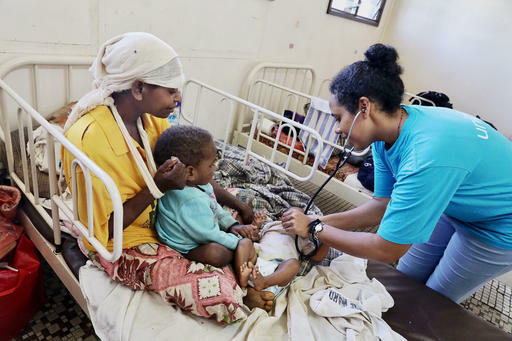 PORT MORESBY/SYDNEY, 23 March 2018 – UNICEF has this week delivered 23 metric tons of relief supplies to Papua New Guinea, including tents and tarpaulins, water purification tablets, hygiene kits, blankets and learning kits as part of ongoing efforts to help children and families who were hardest hit by recent earthquakes. On February 26, a massive earthquake of 7.5 magnitude hit four provinces of Papua New Guinea, followed by another two major earthquakes and nearly 100 aftershocks. More than 100 people were killed, with many more injured in landslides and collapsing houses. The PNG Government estimates 270,000 people are in need of urgent assistance, including 125,000 children. “Children’s lives are in danger,” said Karen Allen, UNICEF Representative for PNG. “With limited access to basic necessities, families are struggling to survive in crowded shelters, or to rebuild homes and food gardens.” To date, UNICEF has already delivered 12,000 packets of therapeutic food and enough vaccines to protect 31,700 children against the increasing risk of disease outbreak and malnutrition. Papua New Guinea already had low vaccination coverage and the world’s fourth highest rate of chronically malnourished children. UNICEF is working with the PNG Government and partners to ensure humanitarian supplies are distributed to affected communities as quickly as possible. Access to remote and isolated villages remains a huge challenge across vast and rugged terrain. UNICEF needs AU$17 million (US$14.6 million) to provide humanitarian assistance to children and families affected by the earthquake over the next nine months. This will help provide clean water, sanitation and hygiene in temporary shelters, psycho-social support in safe places, vaccinations and malnutrition treatment, and support for children to return to school. What happens to emergency patients transported to a Government hospital in Myanmar?